Roll up! Roll up! It’s time for Chimp’s Lucky Dip! Everyone’s a winner! A beautiful, one-off, hand crafted „Human Bein“ painting is the prize for everyone who takes part. 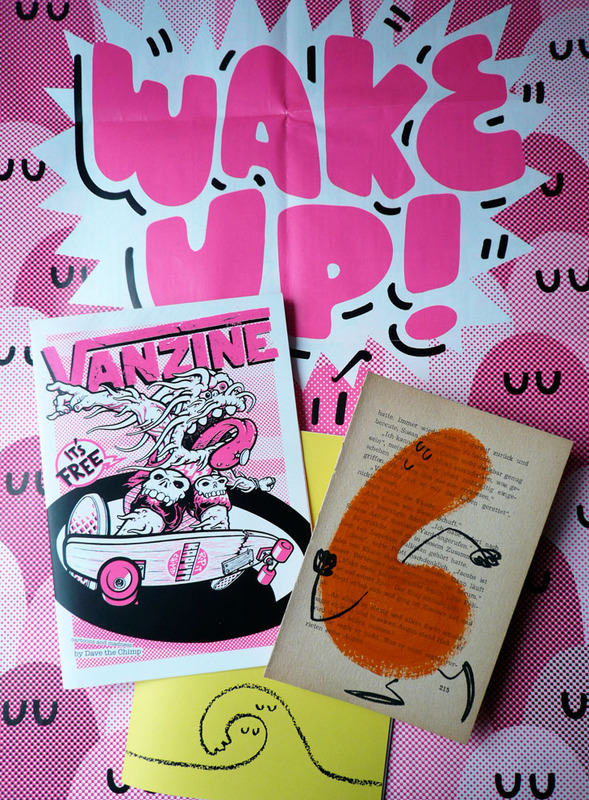 Plus, because Christmas is nearly here, we‘ll throw in a copy of the „Searching For The Perfect Line“ zine (from my show at Vicious Gallery), and a copy of the two-colour „Vanzine“ (which folds out into an A2 poster). The perfect stocking filler for you or a loved one. Sounds good huh? It is – but nothing in life is that simple! Here’s how it works: I have 60 of these „Human Bein“ paintings to sell. Each one is different. I made 130 of these for a show in Essen, and sold each one real cheap so as many people as possible could own a small piece of art. And now I make them available to you! But unlike the people of Essen, you don‘t get to choose which one you get – that’s where the „Lucky Dip“ element comes in to play! It’s a gamble, but not much risk, as each of these paintings is great. The risk element, and the trust, comes from the fact that the only way to get one of these is to mail me 20 euros cash! Are you willing to put your trust in the Postal Service, and put your hard earned cash into the hands of a stranger…? davethechimp(AimKreis)gmail(Punkt)com – subject: Lucky Dip (via).